North Dakota law states that child care providers and their employers must complete specific trainings to become licensed or work in an early childhood setting. Some cities/counties also require additional trainings beyond state requirements. Contact your local County Social Services office to verify training requirements for your location. Training may not be duplicated within a 3-year period. All North Dakota child care operators and employees are required to complete Getting Started, a 15-hour basic child care course, within the first three months of becoming licensed or employed. This training counts towards your annual training requirements. First Aid and CPR training must be completed prior to being licensed or employed. Recertification is required for licensing, but First Aid and CPR do not count toward your annual training hours. Child Care Aware® does not provide these trainings. Contact your local Social Services office for more information on finding First Aid and CPR training providers. Providers caring for infants are required to take a Department of Human Services-approved SIDS training annually. This free e-learning course, offered Child Care Aware®, fulfills the annual SIDS training requirement. Child Care Aware® also offers this course as face-to-face training for a $10 fee. 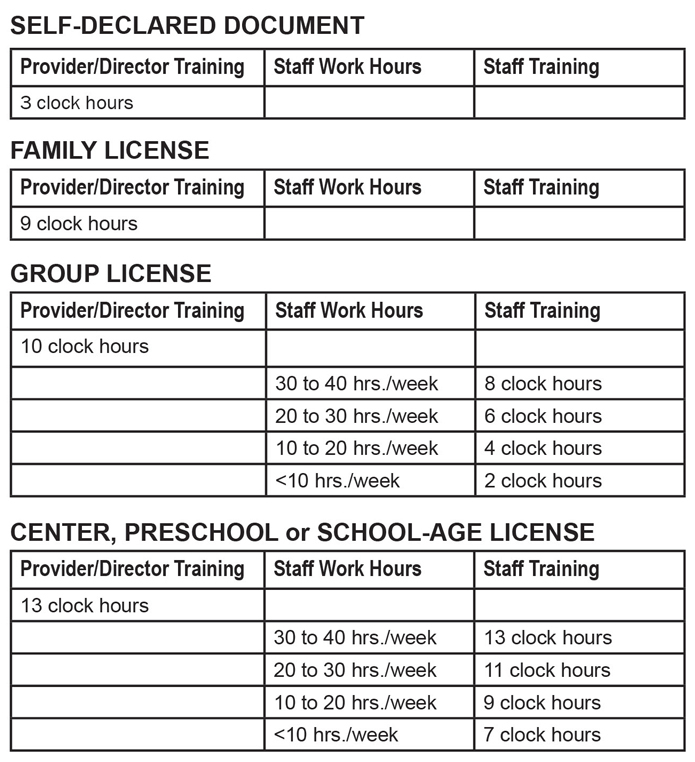 Child care operators and employees must complete a minimum number of approved training hours each licensing year. The number of training hours needed depends on the document type or license type and number of hours worked. Staff should check with their supervisors to determine their program license type and specific licensing period. The Child Care Physical Activity Health Code is an environmental health inspection license renewal standard for Fargo and West Fargo child care centers and group facilities. Child Care Aware® offers online and face-to-face training to fulfill this requirement. Complete this Training Request Form to register for the following courses. NOTE: Training requests should be made by directors to be shared with their staff members. Early care and education programs can lead the way in educating young children and their families on the importance of staying active and eating healthy. You can help children build healthy habits by ensuring your program is a healthy environment for children to learn. This course will illustrate your role in helping to prevent childhood obesity. From day one, children are eager and determined to understand how the world works. They do this through play. In this course, you will learn about the importance of play and the benefits of taking these important learning experiences outdoors. Healthy eating is necessary for healthy development. That’s why it’s so important to offer children healthy food choices; options that will nurture their bodies and fuel brain development. In this course you will learn more about what you can do to promote nutrition and healthy choices for young children. Young children have a variety of food and meal experiences. These experiences shape the relationship children have with food as they enter school, through adolescence and into adulthood. Making the mealtime environment positive and healthy (both nutritionally and socially) is key to forming a child’s eating habits. Early care and education environments are the perfect place to teach, support and foster healthy eating behaviors. Physical activity is linked to learning in so many ways, which is why children need to get moving every day. Join us as we explore how to keep those little bodies healthy and physically active! Complete this Training Request Form to begin setting up your event. Activities, activities, activities…everyone wants to learn more activities. This training will get you out of your seat and focus on the implementation of age-appropriate physical activities for children ages 3-5. Whether you have class inside or out, these simple activities can be modified for your setting. Have equipment that you don’t know how to use? Running out of ideas? At the end of this training, we’ll take advantage of our greatest resource, YOU, to brainstorm new and creative ways to use your equipment! Complete this Training Request Form to begin setting up your event. This training will provide you with tools and tips to design and structure the environment to include ALL young children in physical activity movements. Complete this Training Request Form to begin setting up your event.